Gov. 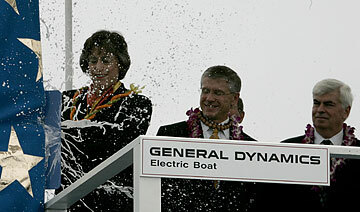 Linda Lingle broke the traditional bottle of champagne on the sail of the nuclear- powered attack submarine Hawaii yesterday in a launch ceremony at Electric Boat Division, General Dynamics Corp. Looking on were Electric Boat President John P. Casey, second from left, and U.S. Sen. Christopher Dodd, D-Conn., right. GROTON, Conn. » Gov. Linda Lingle needed just one good swing to smash the traditional bottle of bubbly against the newest nuclear submarine. And with that, the $2.5 billion USS Hawaii was officially launched yesterday at Electric Boat shipyard. The spray of champagne doused Lingle and those nearby, including Electric Boat President John Casey. The governor took it in stride. "When it rains on a day like this, we consider it a great blessing," she said. The new fast-attack submarine will be home to a crew of 134 when it is commissioned in January. The 377-foot-long Hawaii is the third of 10 submarines of the Virginia-class submarines. The first 10 boats in the class are being built jointly by the Newport News (Va.) shipyard and General Dynamics' Electric Boat shipyard. The class eventually could have 30 ships. Lingle was among several dignitaries at the launching, that also included U.S. Sen. Daniel Inouye, D-Hawaii, U.S. Sen. Christopher Dodd, D-Conn., U.S. Rep. Rob Simmons, R-Conn., and Secretary of the Navy Donald Winter. The newest submarine received a traditional Hawaiian blessing by retired Master Sgt. Raymond Ganotise of the Hawaii National Guard. Ganotise, who is also a kahuna, blew a conch shell as part of the blessing. Adm. Gary Roughead, commander of the Pacific Fleet, addressed the boat's crewmen who were lined along the top of the ship in rows of fours. "For all of you, enjoy this day, take the time to relish a job well done," he said. "After today's break, it's back to work." The Hawaii is the second warship named after the islands. The Hawaii, a surface warship, was launched Nov. 3, 1945, but never commissioned. "Most people, when they hear the word Hawaii, they immediately conjure up pictures of beautiful beaches, lovely dancers and moonlit nights," Inouye said. "Hawaii is all that and more: Our sons and daughters have participated in every war since we became part of the United States." The entry of the Hawaii to the fleet comes as the USS Honolulu, another nuclear-powered attack submarine, is being retired. Pearl Harbor, the Honolulu's home port, held a farewell ceremony for the ship in April before the submarine left for its final deployment. The Navy hasn't picked a home port for the USS Hawaii, but Lingle and Rear Adm. John Donnelly, deputy commander of the Pacific Fleet, have said the submarine may be based at Pearl Harbor.